This year the Electric Vehicle and Clean Energy Expo forms the third and final day of the Smart Future Cities Conference. The conference will be exploring autonomous electric vehicles, clean energy and smart city infrastructure and digital platforms. 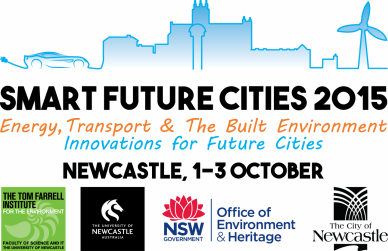 The Electric Vehicle and Clean Energy Expo is delivered by a range of supportive Hunter organisations and businesses, led by the Tom Farrell Institute for the Environment (the organisers) at the University of Newcastle. The Hunter Valley Electric Vehicle and Clean Energy Expo (EVCEE) is the most comprehensive electric vehicle showcase in Australia! The organisers have been running an electric vehicle festival annually since 2011 promoting electric transport and associated manufacturing in our region. Electric vehicles in all shapes and sizes from bicycles to trains are a key technology in making our cities and towns nicer and more prosperous places to live, so we want electric vehicles here, we want them here fast and we want to get Australian business in on the action! The Hunter Valley EVCEE is all about thinking of sustainable transport in fun and innovative ways that support the development of electric vehicle industries in the region. We already build our state's electric trains and mining equipment, time to see what else we can do! The 2014 electric vehicle show attracted more than 5,000 visitors. We anticipate that the 2015 event will attract an even larger crowd excited to join us again for what they experienced in 2014, which was a fun and interactive family day for all ages. We welcome businesses and hobbyists who wish to display any type of electrically powered vehicle to the public whether it be a car, bike, scooter, skateboard, or anything that gets you about with low or no emissions. We also welcome the participation of businesses wishing to present allied sustainable products and services to the public – especially those that have a strong local manufacturing component or have strong and exciting educational focus. We want to celebrate smart technologies aimed at assisting to mitigate against emissions that make cities cleaner, easier and more vibrant. Join us at this premier event for the alternative energy industry. We look forward to your contribution and participation in the 2015 Hunter Valley EVCEE. How do I apply for a site? To view the Exhibiting Terms and Conditions, please open the above document which has all the relevant information about exhibiting.